Christmas Markets in Paris - INSIDR tips for the perfect Christmas season! Looking for more ideas on how to spend your days in Paris? You must download our Free 4-Day Paris Itinerary! If you are visiting Paris this holiday season and want to shop at the best Christmas markets in Paris, here is where to go to feel some Christmas spirit! Are you feeling upset that this year there will not be Christmas Market on the Champs-Élysées? 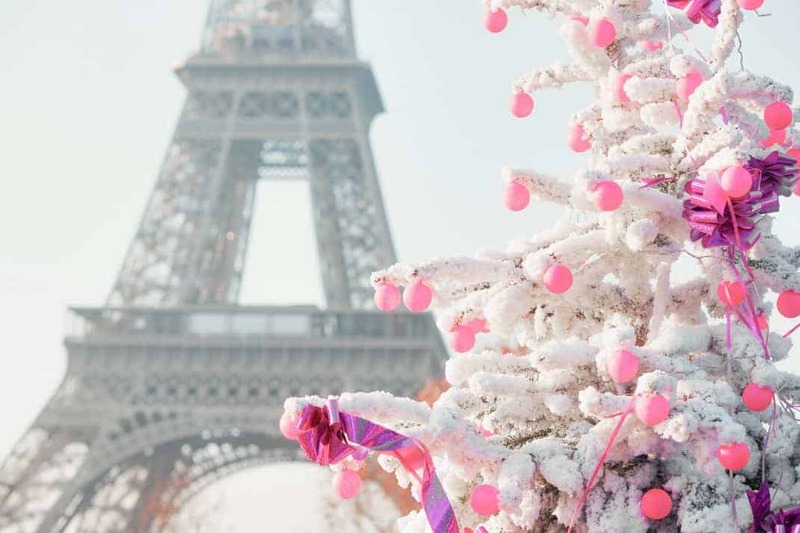 This year’s Paris Christmas fair under the Eiffel Tower welcomes your warm hello!! The Christmas market under the Eiffel Tower is full of wooden cabinets decorated with a variety of Christmas decorations, waiting for you to explore. In addition, you can also skate there! Open from December 1st- January 31st. “A Starry Christmas” is a massive Christmas Village with 70+ stands at Les Halles, right in the center of Paris. Here kids can play games, make arts and crafts as well as write a letter to Santa Claus! This is a really enchanting Christmas market to attend with children or as a family. It is open from November 27th until December 31st, everyday from 10am-9pm, and extra hours on Fridays and Saturdays from 11am-11pm. The Christmas market at La Défense is the largest and most visited Christmas market by Parisian locals. This Christmas market can be enjoyed by children, teenagers and adults and is the Christmas market in Paris that we at INSIDR highly recommend! The stalls at this market are filled with local and artisan products, amazing traditional foods and decorated with an abundance of Christmas lights. You do not want to miss this market, already open as of November 17th. A Christmas market in Montmartre?! We’re in! Come to the Sacré-Coeur and do not miss out on this cute and mini Christmas market! With Christmas atmosphere in every corner of Montmartre, can’t you already feel it?! Many Parisian natives also come to feel this delightful Christmas market to enjoy the brilliant Christmas lights. In the cold weather, drink a cup of hot red wine, buy your favorite Christmas products and enjoy your Christmas celebration at the top of Paris! Open November 21st- January 2nd. The Christmas market near the Notre-Dame Cathedral is in a public garden called Square René Vivian, just between the Seine and the Notre-Dame Cathedral. It is the market to go to for your children to be able to meet (a French) Santa Claus and enjoy daily free entertainment! Additionally in the stalls at this market you can shop for products made by craftsmen such as clothing and glass sculptures. The market is open everyday from 10am until 8pm and on Friday, Saturday and Sundays until 9pm. Open as of December 12th and closing on December 23rd. The Christmas market around the Montparnasse tower mostly sells regional foods in the wooden stalls. If you are in the area and want a tasty snack from the market, here’s where to go! The Christmas market in front of Gare de l’Est sells traditional foods from the Alsace region of France, located in the northeast of France. While this market is known for its delicious and traditional foods such as pretzels, gingerbread, biscuits and foie gras, it also sells fabrics and decorations.